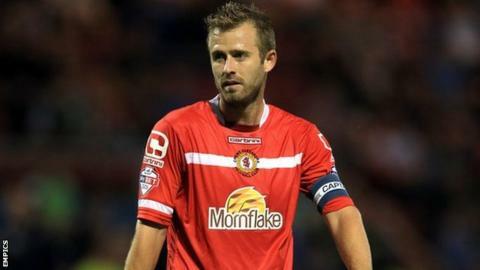 Crewe Alexandra captain David Fox could be out of action for two months after fracturing two vertebrae in his back. The 31-year-old midfielder was injured in Saturday's 2-0 defeat by Blackpool. "He got a tackle and was flipped up in the air and landed awkwardly on his back and pelvis," Alex boss Steve Davis told BBC Radio Stoke. "The x-ray shows he's cracked a few vertebrae in his back and it looks like he'll be out for six to eight weeks at least." Fox is not the only fitness concern for Davis, who is waiting to see how bad Brad Inman's foot injury is after the midfielder was also hurt against Blackpool. The Australia-born former Scotland Under-21 international is waiting to see whether he has broken any bones after a challenge that left Davis angry. "I did remonstrate with the referee who dismissed it, but I'll be sending the DVD of the tackle in," added the Crewe manager. "Hopefully there's no broken bones in his foot and just above it around his shin, but he's on crutches and unlikely to be fit for the weekend."